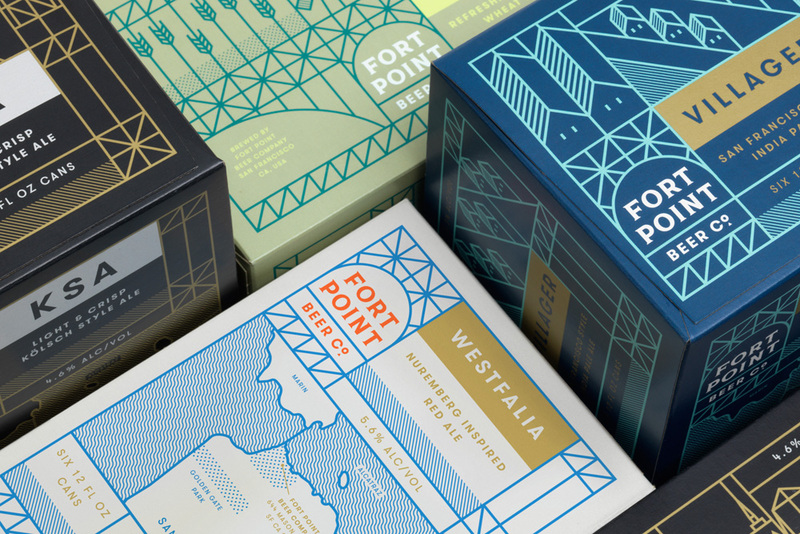 Established in 2014, Fort Point Beer is a craft brewery in San Francisco, CA. 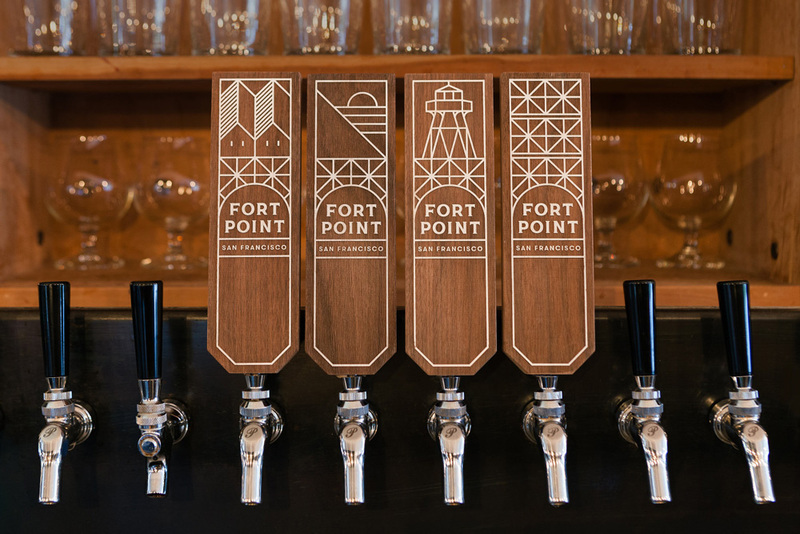 Brewing four core beers, Fort Point also offers seasonals and one-offs that were, until now, only available in bars and restaurants. 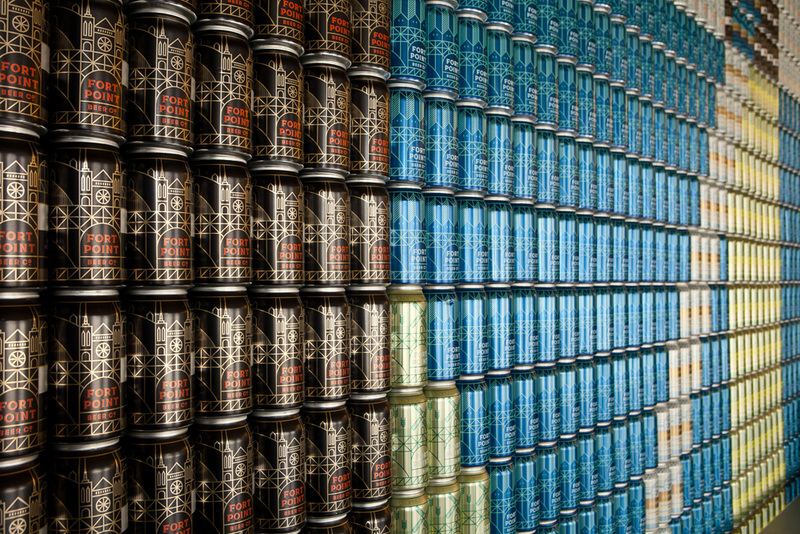 To broaden their reach and bring their beers to the public, the brewer has launched a line of 12 oz cans and a new identity designed by local firm Manual. 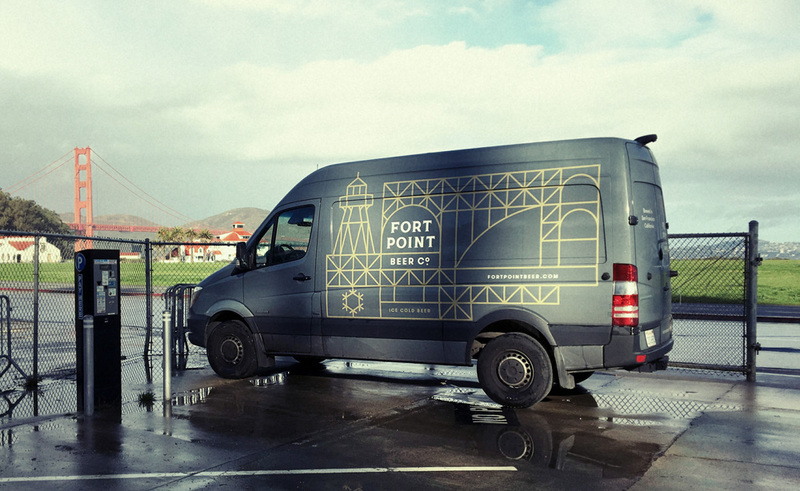 The brewery is situated in a historic Presidio building that was formerly used as an Army motor pool. 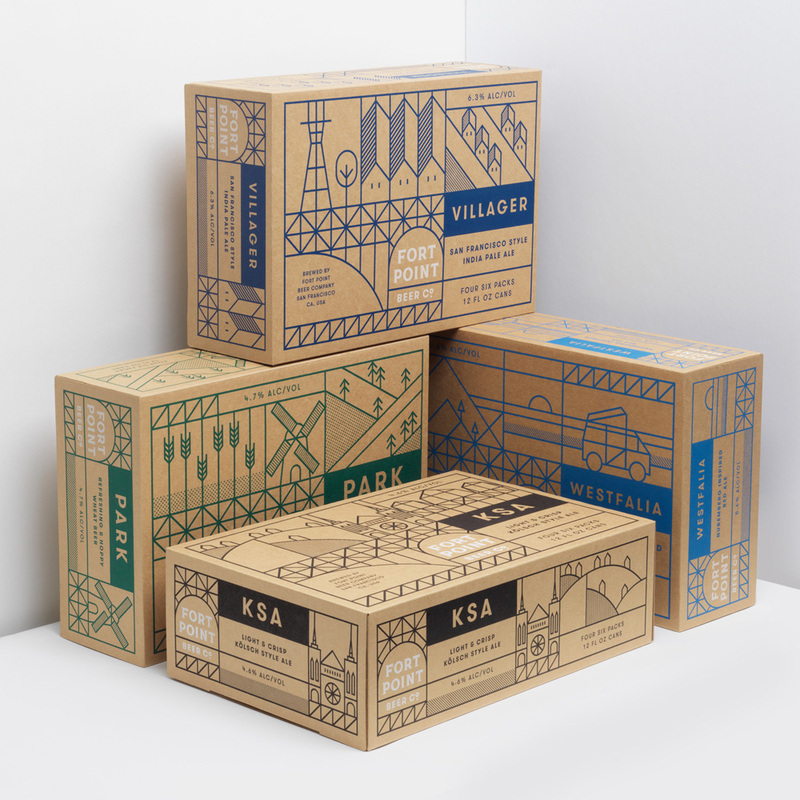 Their iconic location—close to both the Golden Gate Bridge and the Fort Point National Historic Site—provided inspiration for Manual to create the modular, illustrative brand identity that went beyond just a logo, and leveraged recognizable architectural elements of the bridge and the historic site— arches and trestles—as its backbone. Full logo and wordmark detail. On its own, the logo is literally only a small part of the puzzle, serving as the anchor upon which all the rest of the elements are built on. As such, it handles its weight just fine through a chunky serif that contrasts nicely against the thin lines in the arch graphic that surrounds it. 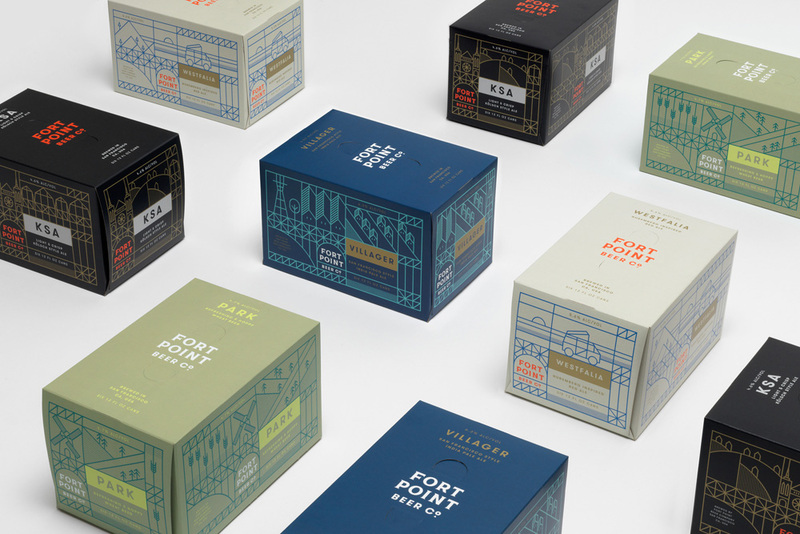 As one of the few typographic elements in the packaging, the logo stands out quite well and complements the line-art approach. [We] developed the grid-based graphic system into a flexible, modular and scalable set of designs that incorporate playful illustrations of San Francisco culture and charm. Sutro Tower, the Dutch Windmill in Golden Gate Park, and a camper van for the Westfalia beer variety, champion the spirit of San Francisco. 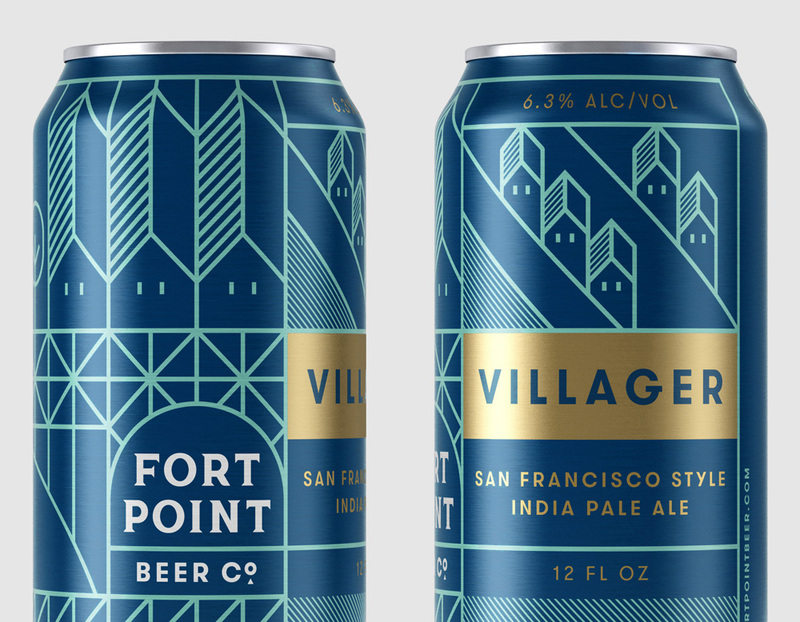 Elements of the city and Bay Area create a unique and authentic sense of place, while helping establish Fort Point Beer Co. as the new wave of San Francisco-based brewing. The distinct color palettes and bold lines of the designs were carefully considered and intentional. 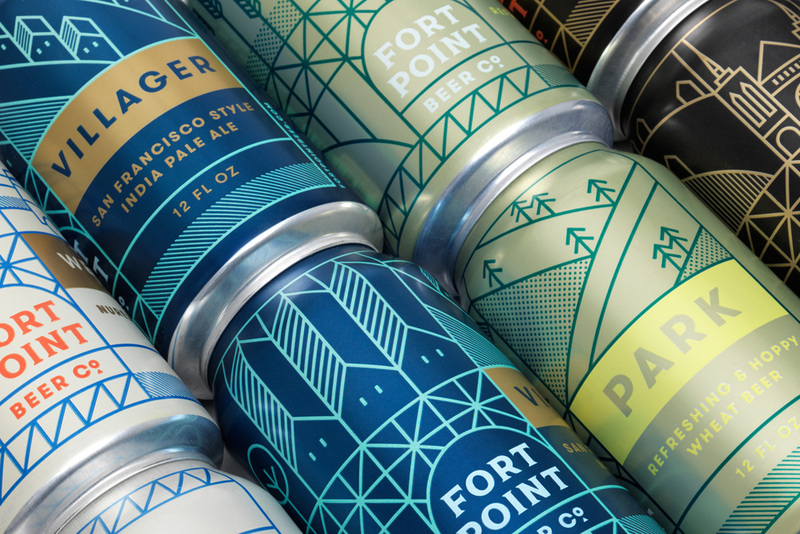 We selected color combinations that would be a deliberate departure from more typical beer packaging, with the intention of cutting through clutter on a shelf or aisle. The result is a set of designs that look elegant, refined and still playful. 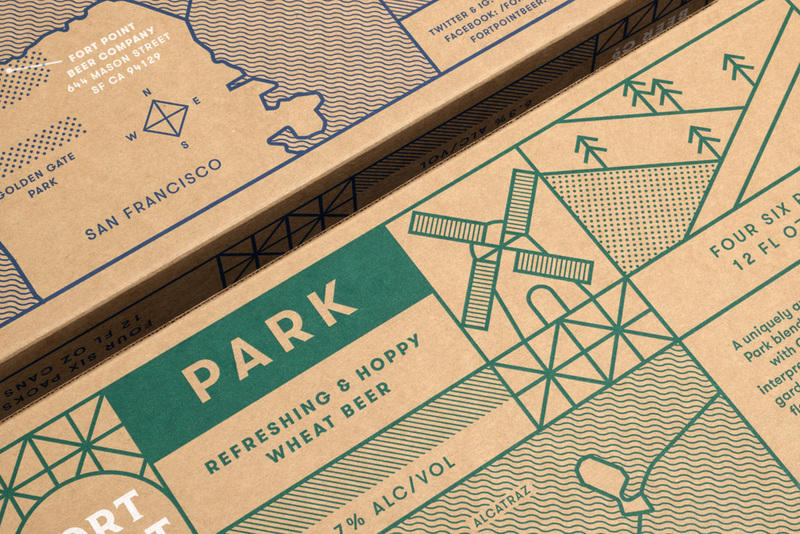 A visual system that’s matching in quality with the beer it contains. 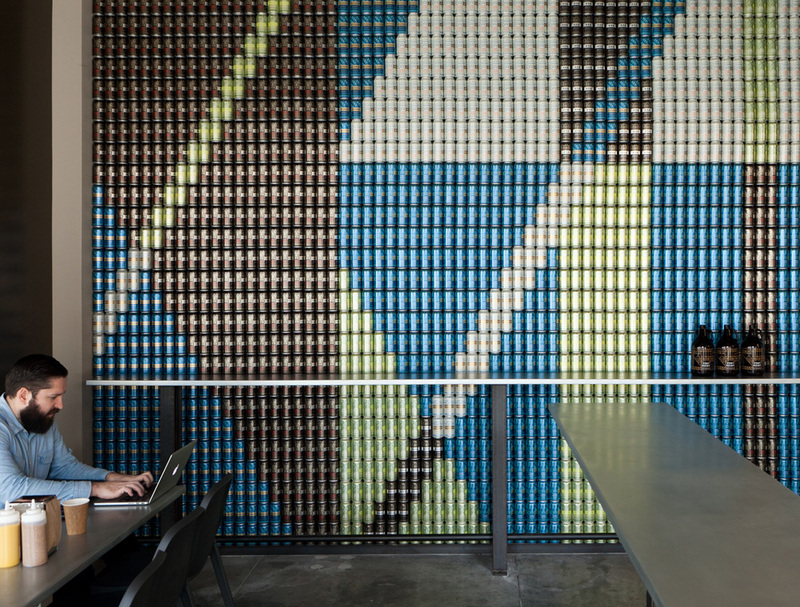 Dense with illustrations, the cans are absolutely stunning. 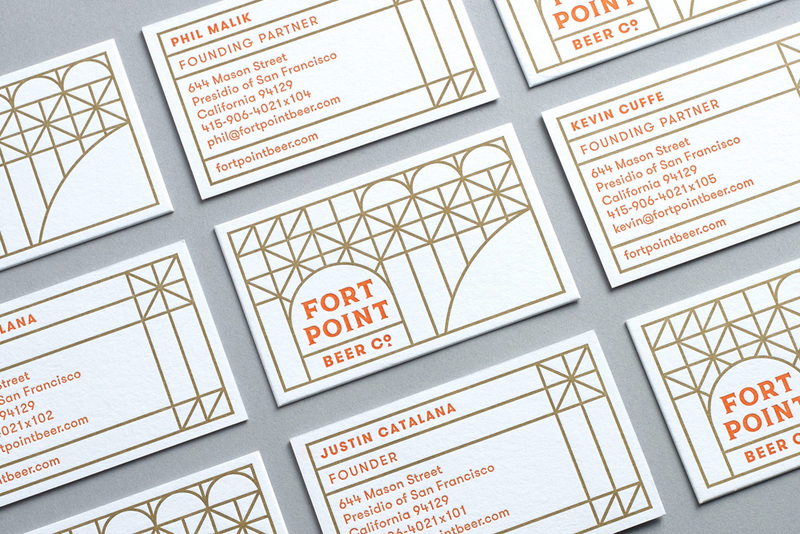 The muted color palette printed on the metal substrate creates a lovely-looking set of beers. I like how the bottom half of the illustrations is consistent while the top half changes to include different designs, creating a literal landscape of San Francisco. Can installation at retail store. Everything else about the packaging system is, effectively, on point. The cartons, the cases, the tap handles… just perfect. 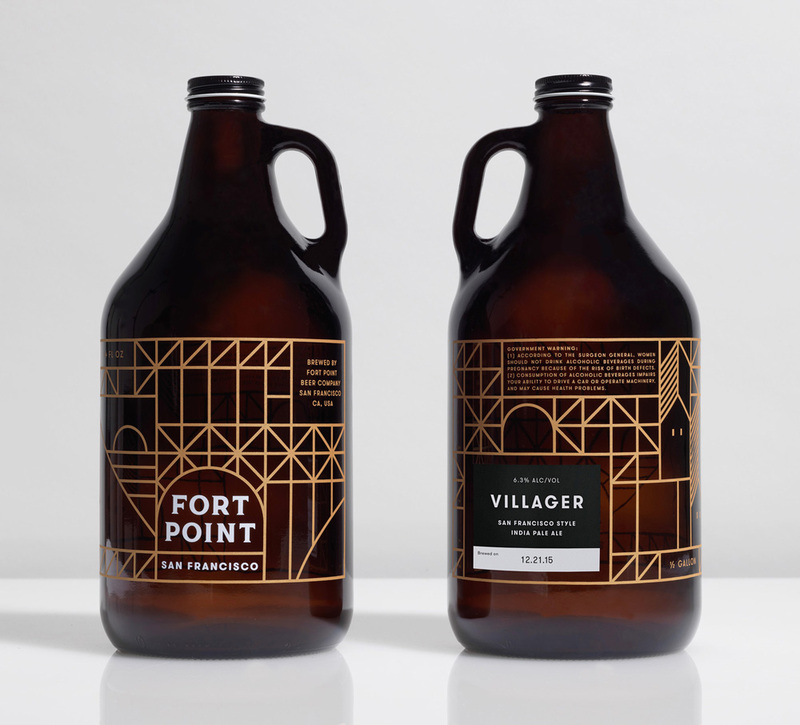 The work certainly feels like it belongs in, and is playing within, the genre of hip craft breweries with minimal and sharp-looking graphics but it’s so well executed and expanded across applications that it stands out as best in class.